Services - Inverness City Taxis Ltd. Explore our scenery and wildlife in one of the most beautiful countries in the world ….. Whether you want to visit the Highland’s heritage in the shape of Castles, Stately Homes, Historic Sites, Gardens, Distillers & Breweries or Speciality Shops; choose one of our coordinated tours or let us put together a customized tour to meet your specific needs. Whatever the size of your party, budget or timescale we’ll make sure you get the most out of your time in the Highlands. 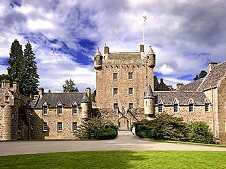 The magical Cawdor Castle dates back to the 14th century. It is not just another cold monument but a splendid house and home to the Cawdor family to this day, lovingly filled with beautiful furniture, fine portraits, intriguing objects and amazing tapestries. Whether you explore one or all three splendidly presented gardens, adventuring in Cawdor Big Wood or putting on the nine-hole golf course we are sure you’ll leave with very happy memories. The course of British, European & world history was changed here on 16 April, 1746 when the Duke of Cumberland defeated Bonnie Prince Charlie & the Jacobites resulting in over 1500 deaths during the battle. The Duke then went on to execute all the wounded Jacobites & prisoners, approx. 450, earning him the name of ‘The Butcher’. Walk on the battlefield and visit the interactive Visitor Centre. Hear genuine accounts from the characters involved in the battle and put yourself in the heart of the action in the Battle Immersion Theatre. 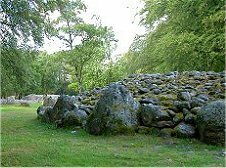 Clava Cairns – A well preserved Bronze Age cemetery of passage graves; ring cairns, kerb cairns and standing stones in a beautiful setting. 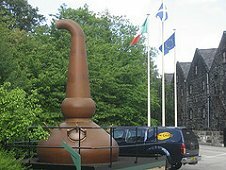 Take a tour of the distillery and see the tall, slim copper stills which produce our award winning whiskies. Sample some of our malts or fill your own bottle and take home as a memento of your visit. Finish with a spot of retail therapy in the gift shop which offers a wide range of whiskies and exclusive Tomatin merchandise. Experience a glimpse of medieval life from the ruins of this great castle. The castle’s stories are told through a remarkable collection of artefacts left by its residents, historic replicas and a short film. 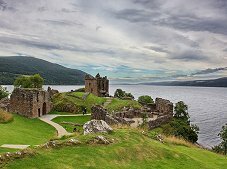 A stunning panoramic view of the iconic ruins, against a backdrop of Loch Ness and the hills of the Great Glen, can be enjoyed from the cafe which offers a wide range of homemade cakes and scones. The castle shop sells a wide selection of gifts, souvenirs, books and jewellery. March into Britain’s mightiest artillery fortress for an unforgettable experience. 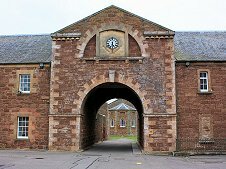 Built after the Battle of Culloden, it was designed as the ultimate fortification against further unrest but its sophisticated defences were never tested however it is still a working army barracks today housing a regular infantry battalion of the British Army. There is much to see including defences bristling with canons, historic barrack rooms, a superb collection of weapons & peaceful Regimental Chapel. In the summer you can experience a flavour of what life was like in Scotland past with a series of live costumed performances. Scotland’s second biggest loch, this 23 mile stretch of water is one of our biggest tourist destinations, famous for its monster. Sightings of Nessie have been reported for centuries dating back to 565. In 2003 a BBC expedition surveyed the entire loch using sonar and concluded no monster exists but it should be remembered that it is logically impossible to prove that something does not exist – only that it has not been found !! 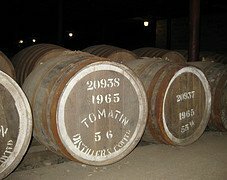 Glen Ord, Dalmore & Glenmorangie make up our whisky trail. Glen Ord, situated on the edge of the Black Isle creates a magical malt which is sweet, malty & dry on the palate. 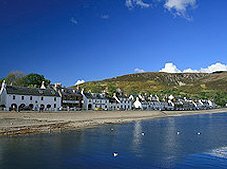 Dalmore which sits of the shore of the Cromarty Firth boasts the award winning Highland Single Malt Whisky and the world famous Glenmorangie, located on the shores of the Dornoch Firth, houses Scotland’s tallest stills. Alongside its classic ‘Original 10 year old’, Glenmorangie also produce a range of other whiskies including the limited edition ‘Dornoch’. We depart Inverness and cross the Black Isle before turning west towards Achnasheen. On by Loch Maree and the Beinn Eighe National Nature Reserve before passing through Gairloch. The stunning vistas on this journey to Inverewe are some of the most spectacular in Scotland. We have two and a half hours in the spectacular gardens, widely regarded as the most famous in Scotland – this is also a lunch stop. After leaving the gardens we continue north and follow the Atlantic Coast past Gruinard Island before coming to Dundonnell. 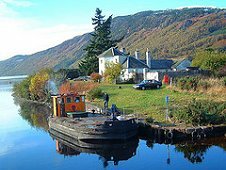 We will pass Corrieshalloch Gorge, one of the most spectacular canyons in the Highlands & return to Inverness by Marybank and Beauly – an almost completely circular tour. If you desire many photo stops en route and a visit to Corrieshalloch Gorge then you should allow at least an hour extra time. Relax & explore the Isle of Skye, one of Scotland’s most beautiful and tranquil islands. But Skye isn’t the only highlight of this tour. 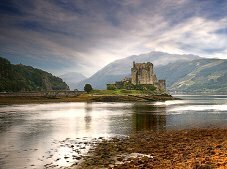 On the way to and from the island you’ll see ancient castles including Eilean Donan, the most pictured castle in Scotland, pass charming villages such as Achnasheen and drive through the picturesque Black Isle. You’ll even get a chance to do a bit of monster spotting along the shores of Loch Ness. Lots of photo opportunities on this tour so the camera is a must. 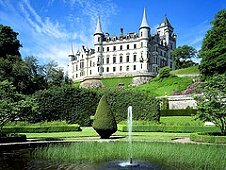 Known as the ‘Fairytale Castle’ this is the most northerly of Scotland’s great houses. The castle is breath taking, as are the views from its majestic balcony overlooking the amazing French gardens and the Dornoch Firth. The superb falconry display is said to be one of the highlights of this visit. The presenter is very passionate about his majestic birds and the ancient art of falconry; he has a wonderful and entertaining way of presenting the information. Over the years we have established excellent relations and provide a wide variety of services for many hotels, guest houses, health care services and other businesses in the area. As well as providing transport for their guests and clients, we are engaged to transport staff to and from the establishments, in particular, those members of staff working unsocial hours. Contract hire to and from business premises particularly suitable for staff working unsocial hours. Call us to arrange transport to and from Inverness Airport. Call us for contract hire to and from Inverness Airport to meet your requirements. Office parties, theatre visits, sport & recreational outings – all sizes of groups catered for. Please call us for a favourable quote. The Highlands of Scotland provides some of the best golf courses in the country including several top-ranked championship courses such as Royal Dornoch, Castle Stuart & Nairn. With our wealth of knowledge & experience. we will be happy to provide advice and transport to and from your chosen venues. Email us for information / quote. We can offer VIP cars suitable for the Bride, Bridesmaids & Mother of the Bride and other VIPs / guests at considerably less than the specialists. Email us for information / quote.